The piano is undoubtedly one of the most enjoyable musical instruments to play. Whether you are a hobbyist or a professional, you can never get bored sitting and churning out a tune or two. But you need to have a high quality piano in order to get the best sound and experience out of it. When it comes to digital pianos and electric keyboards, Casio has always been at the forefront of the industry. In fact, they created the very first portable digital piano in 1980. Modern Casio digital pianos have made great strides in quality of tone and feel, and they rank among some of the best digital pianos out there today. But with all the options out there, what is the best Casio keyboard? In this article, we provide Casio keyboard reviews to help you choose the perfect instrument from their great lineup. Casio really went all out with the PX-560 Digital Stage Piano They they threw in their best keyboard action, their best lineup of instrument sounds, and their best speaker system. They threw all of that into a lightweight, portable package. And they bundled it with an intuitive, streamlined user interface. There just aren’t many pianos in this price range that can compete. 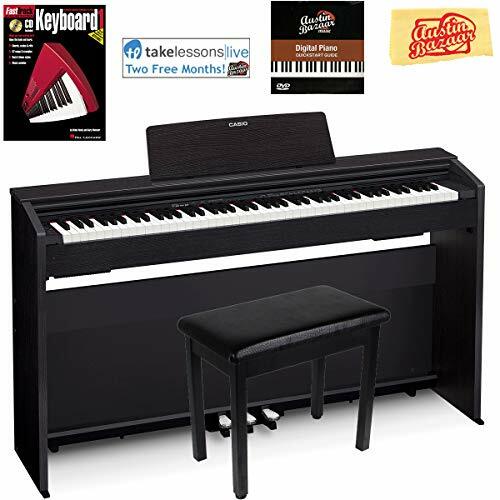 This piano features Casio’s top-of-the-line Tri-Sensor Scaled Hammer Action II keyboard, giving you that real piano feel reminiscent of a grand piano. The sound delivers as well, pumping out true-to-life piano sounds through the AIR Sound System. And with 550 tones to choose from, you can have a lot of fun experimenting with your music. 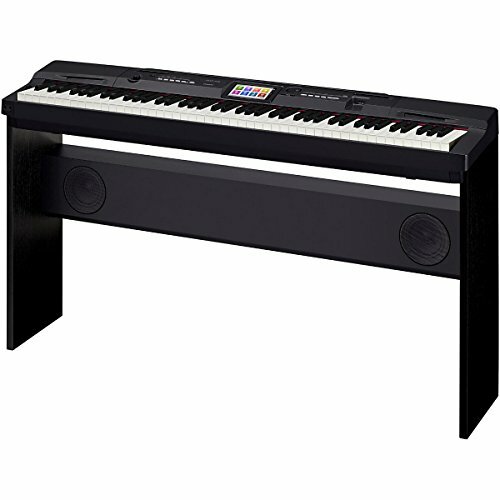 The PX-560 is a stage piano, so if you’re a gigging musician this one’s your best bet. But this keyboard is equally at home in your living room – it just won’t have the console piano looks of console-style keyboards like the PX-870 (below). Although this is the priciest piano on this list, you’re definitely getting a great instrument and a lot of bang for your buck. 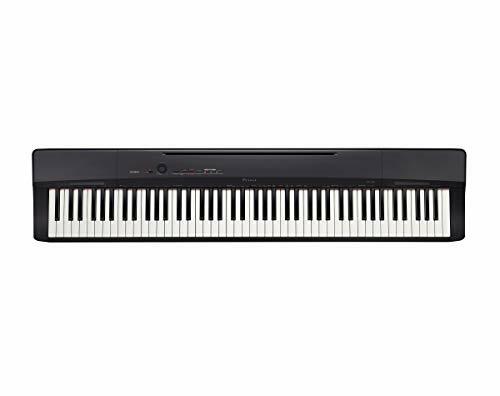 The Casio Privia PX-870 has everything you need in a great digital piano. It’s packed with features that help mimic the feeling and sound of playing a real piano. These include a lid, hall, stereo resonance, and key off simulators. And with Casio’s Tri-sensor Scaled Hammer Action Keyboard II technology, the keyboard is very sensitive and responsive. After writing this Casio PX-870 review, we came away very impressed with the realistic sound and feel of this keyboard. The PX-870 facilitates USB and MIDI connectivity and can store up to 70 preset songs for practicing. Additionally, it allows for both recording and playback of playing sessions, which enables you to track your progress. This is a great tool for training and practicing. Because of this, the Casio Privia PX-870 is an overall great piano for the developing musician. When it comes to digital pianos, it doesn’t get much better than the Casio CGP-700. This keyboard has an array of features that will instantly make any pianist fall in love with it. Its keys are just as good as those on a grand piano thanks to their high responsiveness and weighted hammer action. It also has a high definition touchscreen display where you can keep track of all your favorite rhythms and tones. These features are complemented by the 6 powerful 3-way speakers that amplify anything played on the instrument to a level as loud as you need it. This instrument also comes with USB ports, stereo and auxiliary inputs, and audio/MIDI recording options. This is a do-everything digital piano that gives you the feeling of playing a top-of-the-line grand. The Privia PX-770 is another great Casio keyboard that features everything you need for a great piano experience. The AiR sound technology facilitates the production of different sounds in their natural harmonies. Also, its sound engine offers an unmatched level of speed and accuracy due to the three sensors accompanying the hammer action keyboard. This piano offers up to 250 built-in instrument tones for players to choose from. They can therefore develop skills playing multiple styles. This piano also comes with pedals that do a great job of mimicking the response of real piano pedals. And the USB MIDI connectivity works with Mac and Windows computers out of the box, no additional drivers needed. The compact, 25-pound Casio PX-160 is the ultimate choice if you need an instrument that you can easily move around. It’s fitted with Casio’s Acoustic and intelligent Resonator (AiR) technology, which according to many Casio piano keyboard reviews produces the same quality sound as a concert grand piano. Furthermore, this keyboard offers great piano feel hammer action keys, and three sensors under each key ensures that the sound is incredibly responsive to your key touch. The two built in 8-watt speakers is capable of high volume output, while the headphone jack allows you to play without annoying family and neighbors. The keys have an elegant finish with simulated ivory and ebony textures. 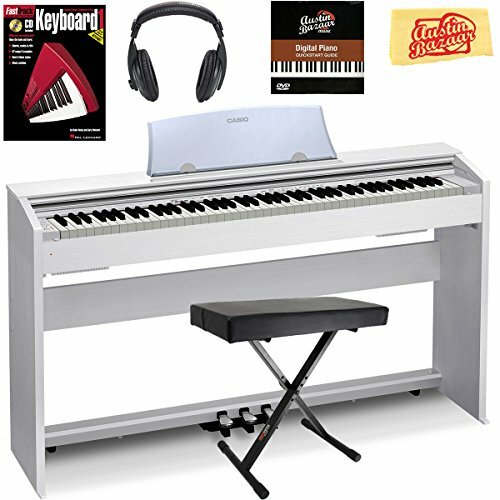 Casio makes some of the highest quality digital pianos and keyboards available. But every model has its own strengths and features, and it’s important to consider what your needs are before deciding. Hopefully our Casio keyboard reviews will give you the information you need to choose the best model for you. The best Casio digital pianos on this list are great instruments that are suitable for musicians of all levels, whether you are just messing around in your living room or playing professionally. Regardless of which one you go for, these digital pianos featured in this Casio keyboard comparison are among the best on the market and will provide you with years of musical fun.